Individual terrace with view on tropical garden. Possibility to rent a car nearby. 2 other studios are available for rent in the same villa. Bathroom with large walk-in shower, sink, toilet and bidet. 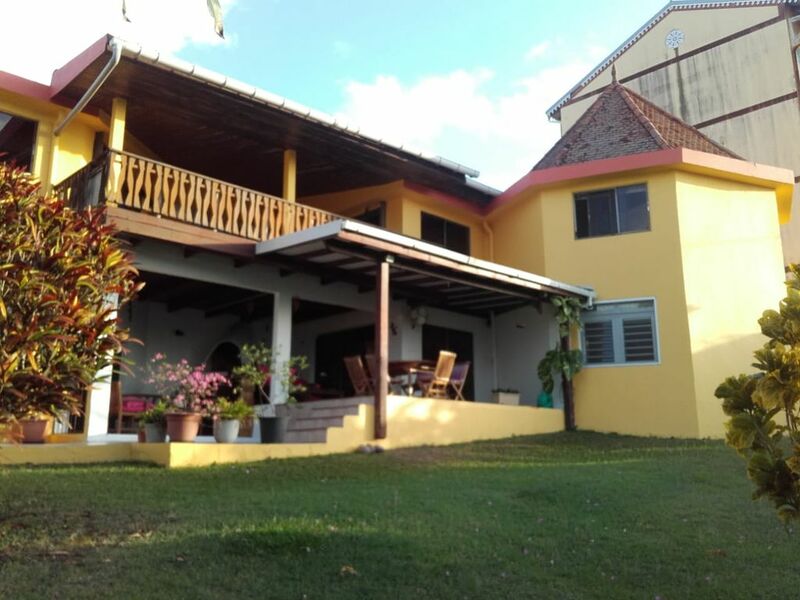 We recently returned from a wonderful trip to Martinique, where we stayed in one of Gil's lovely studios for the duration. Originally we had thought to spend a few nights there, then some time on another part of the island, but the island is so small, and the studio so centrally located that it made the most sense to stay. We traveled all over the coast and to the other side of the island to La Caravelle, nothing was further than an hour's drive and so many beautiful coves and snorkeling and swimming within 15 minutes. The studio is cozy and clean, spacious and quiet. Right up the hill from a small secluded beach which our two year old loved-- there is nice shade and doesn't get very busy. Gil is warm and welcoming and an encyclopedia of knowledge about the island. He welcomed our son to play around in his lovely garden and patio that overlooks the bay. He is generous and so genuinely committed to the guests and the space, and the studios feel like home because of it. We saw very few other Americans while there, and while we are a bilingual family, I was surprised. Martinique has all the amenities, health care, and clean water of France, while maintaining its own rich culture and of course natural beauty. Lovely. The property was exactly as described/shown. It is a very spacious, nicely-furnished studio equipped with many useful utilities (stove top, microwave, tv, full size refrigerator and freezer, counter space, closet space, patio table and chairs, etc.) The bathroom was spacious, clean, easy to use. There were few to no bugs (mosquitoes or other). The air conditioning was easy to use and regulate ourselves (requires door key). The studio has a completely separate entrance from the main house. The location is EXCELLENT. There are places to eat and buy food within walking distance. We rented a car during our 4 day stay (if you plan to do this just be aware they are almost all manual transmission). Parking was free/easy to find. From this location we were able to visit many sites all over the island. We also took advantage of the ferry to Fort de France during our stay which stops right at the nearby beach (5min walk). The local beach (l'Anse Matin) was actually our favorite beach on the island (we visited several guide-book recommended beaches during our stay). It has a nice/relaxed vibe and was not overly crowded. The water was warm, calm, and very clear. We spotted some interesting marine life here as well (bring goggles if you want to see some cool stuff!). There are multiple places to eat and drink along the beach as well. One note about walking around: The property is at the top of a somewhat steep hill (only about 100 meters long). Walking anywhere requires you to walk down/up the hill. If hills or heights are a problem for you, walking down might make you a little nervous the first few times you walk it. There is a slightly less steep but longer hill a few minutes out of the way if the hill is too steep for you. Our hosts were extremely welcoming and helpful during our stay. They were happy to give suggestions and respond to our questions about the area and the island. None of us spoke much french but we had no problem communicating with them in English before and during our stay. We have only positive emotions for this studio. It is exactly like in the pictures, very very clean and cozy. Gil with his wife gave us good advice where to go and what to do - helped us in every way they could. Everything that is done by heart is done good!!! Merci à Martine et Gil pour leur accueil, leur gentillesse et leurs conseils. Le studio est très propre, bien aménagé et bien situé. Nous avons pu visiter l'île du Sud au Nord sans aucun problème. C'est une bonne adresse à conserver et à partager. Parfait petit cocon au calme et à 150 m d’une très belle anse! Gil et Martine sont des hôtes très accueillants et d une grande gentillesse sans cesse préoccupés de votre bien être. Ils sauront également se montrer très discrets si vous le souhaitez. Grace à Gil nous Avons visité l île munis de nombreux renseignements et astuces fort utiles et appréciables. Vous aurez aussi à disposition dans le studio liste et description des restos, commerces et divers lieux à visiter. Studio contient tout ce qui vous sera nécessaire. À recommander vivement et sans hésitation. Encore merci à vous Martine et Gil pour votre gentillesse 😉. At the heart of the regional park of Martinique.